Hailing from Manchester, New Hampshire, Reckless Force is made up of four dudes who love to party and play heavy metal. Formed in May 2012, the band spent its early years living up to its name, earning a reputation for raucous basement parties and drinking beer. 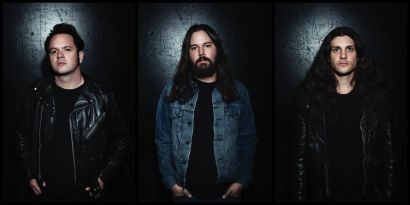 A number of lineup changes kept the band on the sidelines, out of the recording studio and away from the stages for a while, but over the last few years, the band has found a stable, solid lineup, has been writing new songs and is making a name for itself all over New England, and beyond. With a sound rooted in the glory days of the New Wave of British Heavy Metal – a sound seldom heard in newer bands these days – the band builds in elements of U.S. power metal, ’70s hard rock, traditional metal, and even a bit of thrash and speed for good measure. The result is A Distant Planet, the band’s four-song debut EP, and though it may only have four songs, one of which is more of an interlude, it packs a serious punch and shows why the band is deserving of a spot on the Legions of Metal Festival in Chicago, which it played last year, or an invitation to perform as part of the Witches Hex Fest pre-show in Cleveland, Ohio, later this year. “Join The Hunt” kicks off the EP in snarling fashion with some wild feedback before the band launches into an up-tempo riff and drum onslaught that is followed by some quick guitar flourishes before Fife Samson’s haunting, ominous vocals come in. The main riff, anchored by Paul Lennon’s hammering bass work, is bolstered by Dylan Lee’s steady drumming, with plenty of cymbal action. Midway through the song, things slow down a bit, only to build up to an impressive solo section, tapping and all, before returning to that familiar, pounding main riff. Samson’s vocals are one of the unique aspects of the band. Bearing a haunting smoothness in his voice, the only comparison that comes to mind is Jason Decay of Cauldron, however Samson is not content to stay in the comfortable mid-range, reaching for the those higher-pitched shrieks when called for (see his extended note on “time” in “Sands (Teaser)”). The much slower, still haunting “Sands (Teaser)” features a warm bass tone from Lennon and splashing cymbals from Lee before delving into some six-string theatrics from Samson and lead guitarist Greg Hoyt. Think Black Sabbath’s “Planet Caravan” for an overall vibe. Following “Sands (Teaser)” is the high-energy, straight-ahead rocker “Wicked Woman.” Full of fire, the song explodes out of the speakers as Samson sings, “Wicked woman of the woods, possessed by voodoo fire, Evil lurks within her mind, she’ll capture your desire.” Never letting up on the gas pedal, the band employs a relentless thrash riff, making “Wicked Woman” the fastest song on the EP and it sees Samson unleash some banshee-like wails. Overall, it calls to mind Paul Di’Anno-era Iron Maiden or even Grim Reaper. Closing out the EP in epic fashion is “Prophet,” which clocks in at just over 6 minutes and features a call and response in the verses, as Samson and Lee trade off lead vocal duties, Lee showing he is also capable of ascending to falsetto vocal heights. The majority of the song features a mid-tempo, galloping riff as Samson and Lee tell the tale of a warrior being sent on a mission to assemble an army and conquer faraway lands. As the song progresses, the tempo picks up and by the time it reaches the solo section, it really allows Hoyt to shine as his fingers fly all over the fretboard, unleashing a frenetic solo that is sure to raise the air guitars in the live setting. A Distant Planet looks as good as it sounds, featuring some absolutely killer artwork by Sheep Ecuté depicting a scantily-clad female warrior staring off into the cosmos, as a distant city floats in the clouds. One look, and you know you’re in for a wild heavy metal ride as soon as you press play. 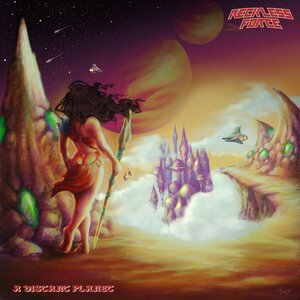 Although A Distant Planet was released last December, Reckless Force is hard at work on a follow-up EP. If A Distant Planet is any indication of what the band is capable of, it won’t be long before they are ascending the ranks of the New Wave of Traditional Heavy Metal, much like Night Demon, Visigoth and Haunt.